Hurricane Issac has now reached hurricane status. It is over 200 miles across and is moving towards land at 10 miles per hour. There are fears that Issac will be at least 2 thirds the strength of Katrina but also has the potential to be much stronger. A state of emergency has been declared in the state of Louisiana. Many people fear after the 1800 deaths and the 80% flooding that occurred in 2005 that Issac could bring with it a similar catastrophe. We at the Normal Appeal managed against all odds to raise £2350 in 2005/6 to aid the musicians' clinic in New Orleans. We have the infrastructure poised to offer you the assistance needed to get your donation to the right people. The NOMC - New Orleans Musicians Clinic - is our favored partner. They are reliable and have been doing great work in New Orleans well before Katrina struck and were very much a big player in the rising of New Orleans from the devastation of 2005. Please give generously. So many people say to me 'It's an American problem!' There is no difference from having the compassion to help those that need help in New Orleans than that of the victims of the Earthquake in Pakistan or that of the Tsunami in south east Asia. Very little assistance was given to the victims of Katrina by the Bush administration in 2005. The people that are helped by NOMC are already poor and vulnerable. There is no NHS to fall back on. Those that have nothing only get help from organizations like the NOMC who have enough compassion to help those that need it. So give generously not only in a crisis like Katrina or Issac, though your help is needed more than ever now, but remember these people need your help all the time. Help keep the birthplace of Blues and Jazz alive and show a little love to the musicians and their families that make New Orleans the place that it is. The NOrMAL Appeal has sent $876 to the New Orleans Musicians Clinic, after organising a series of musical events in Rauceby, Sleaford and Lincoln to raise cash for the New Orleans musicians who lost their livelihood when Hurricane Katrina hit them last August. Their three-band Lincoln Drill Hall concert in December was recorded by PEK Sounds record label and the CD of the concert is selling well. 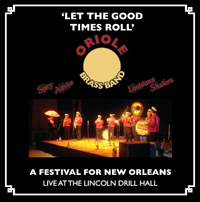 New Orleans Music magazine describes the marching band tracks that make up the main body of the 70 minutes of music as "very effective and authentic…possibly the best yet on record by a British parade band". Most of the musicians playing on the recording are from the East Midlands, including bandleader Mick Burns from Spilsby who organised the concert for NOrMAL. The magazine sums up the CD as: "some very good music by musicians who get little exposure". The CD is available direct from the Normal Appeal by emailing info@normalappeal.org.uk or at Music Plus in Watergate, Sleaford and the Box Office at Lincoln Drill Hall. The £10 purchase price will go, without deduction except for bank charges, to the Jazz Foundation of America New Orleans appeal.